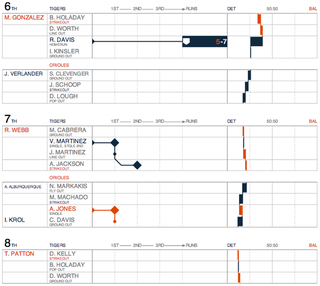 You might remember Statlas's baseball graphics from the end of last season, which aimed to provide a more contextual, visually-appealing update to traditional MLB box scores. Check Out These Beautiful (And Useful) Graphic MLB "Box Scores"
There's almost too much information here—the outcome (and effect on win expectancy) of every plate appearance, plus the type, velocity, and outcome of every pitch—but it's neatly presented and a load of fun to dig through. Go check some of them out. What Are New York City&apos;s Most Popular Dog Names? When And Where Do Americans "Rise And Grind"?